The Funky Felter: Yay! I've been featured! Thank you Indie Quarter! Yay! I've been featured! Thank you Indie Quarter! A great up and coming indie design blog featured my felted work today! I'm honored that IndieQuarter.com chose to do a write up about my funky felter website and my Etsy shop. You can read the entire article here. And, of course, be sure to browse around and read a few more of their featured articles too! Indie Quarter highlights an array of talented artists and crafters. This is what they have to say about themselves: "Indie Quarter ia UK based blog, dedicated to independent designers, makers, artists and crafters. It is updated each week day (or thereabouts) to bring you the latest offerings from fashion designers, artists, handbag designers, ceramicists, photographers, jewellery designers, stationers, knitwear designers and so on. The blog was set up in 2005 by Jenny and Richard Hudson of Vanilla Storm." Through Vanilla Storm, they also offer web design services. And, you can even buy advertising space on their lovely blog. You can read all about them here. 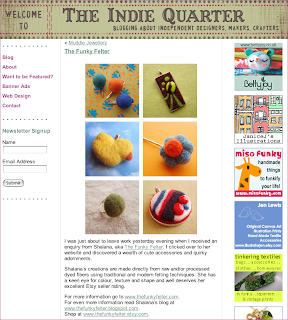 A big thanks to Indie Quarter for their kind words about my little felts!